Thomas Lanier Williams III (March 26, 1911 – February 25, 1983), better known by the pseudonym Tennessee Williams, was a major American playwright and one of the prominent playwrights of the twentieth century. The name "Tennessee" was a name given to him by college friends because of his southern accent and his father's background in Tennessee. He won the Pulitzer Prize for Drama for A Streetcar Named Desire in 1948 and for Cat on a Hot Tin Roof in 1955. In addition to those two plays, The Glass Menagerie in 1945 and The Night of the Iguana in 1961 received the New York Drama Critics' Circle Awards. His 1952 play The Rose Tattoo (dedicated to his lover, Frank Merlo), received the Tony Award for best play. Genre critics maintain that Williams wrote in the Southern Gothic style. Southern Gothic is a subgenre of the Gothic writing style, unique to American literature. Like its parent genre, it relies on supernatural, ironic, or unusual events to guide the plot. Unlike its predecessor, it uses these tools not for the sake of suspense, but to explore social issues and reveal the cultural character of the American South. The Southern Gothic author usually avoids perpetuating Antebellum stereotypes like the contented slave, the demure Southern belle, the chivalrous gentleman, or the righteous Christian preacher. Instead, the writer takes classic Gothic archetypes, such as the damsel in distress or the heroic knight, and portrays them in a more modern and realistic manner—transforming them into, for example, a spiteful and reclusive spinster, or a white-suited, fan-brandishing lawyer with ulterior motives. One of the most notable features of the Southern Gothic is "The Grotesque"—this includes situations, places, or stock characters that often possess some cringe-inducing qualities, typically racial bigotry and egotistical self-righteousness—but enough good traits that readers find themselves interested nevertheless. While often disturbing, Southern Gothic authors commonly use deeply flawed, grotesque characters for greater narrative range and more opportunities to highlight unpleasant aspects of Southern culture, without being too literal or appearing to be overly moralistic. Williams described Southern Gothic as a style that captured "an intuition, of an underlying dreadfulness in modern experience." His troubled family provided inspiration for much of Tennessee Williams' writing. He was born in Columbus, Mississippi, in the home of his maternal grandfather, the local Episcopal rector (the home is now the Mississippi Welcome Center and tourist office for the city). His father, Cornelius Williams, was a traveling salesman who became increasingly abusive as his children grew older. Dakin Williams, his brother, was often favored over him by their father. His mother, Edwina Dakin Williams, was a descendant of a genteel southern family, and was somewhat smothering. She may have had a mood disorder. By the time Thomas was three, the family had moved to Clarksdale, Mississippi. At five, he was diagnosed with diphtheria, which caused his legs to be paralyzed for nearly two years. He could do almost nothing during this time, but then his mother decided she wouldn't allow him to continue wasting his time. She encouraged him to use his imagination and gave him a typewriter when he was thirteen. In 1918, the family moved again, this time to St. Louis, Missouri. In 1927, at the age of 16, Williams won third prize (five dollars) for an essay published in Smart Set entitled, "Can a Good Wife Be a Good Sport?" A year later, he published "The Vengeance of Nitocris" in Weird Tales. In the early 1930s, Williams attended the University of Missouri–Columbia where he was a member of the Alpha Tau Omega fraternity. It was there that his fraternity brothers dubbed him Tennessee for his rich southern drawl. In the late 1930s Williams transferred to Washington University for a year, eventually taking a degree from the University of Iowa in 1938. By that time, Williams had written what would be his first publicly performed play, Cairo, Shanghai, Bombay! at 1917 Snowden in Memphis, Tennessee. This work was first performed in 1935 at 1780 Glenview, also in Memphis. Tennessee was close to his sister Rose, who had perhaps the greatest influence on him. She was a slim beauty who was diagnosed with schizophrenia and spent most of her adult life in mental hospitals. After various unsuccessful attempts at therapy, she became paranoid. Her parents eventually allowed a pre-frontal lobotomy in an effort to treat her. The operation—performed in 1937 in Washington, D.C.—went badly and Rose remained incapacitated for the rest of her life. Rose's failed lobotomy was a hard blow to Williams, who never forgave their parents for allowing the operation. It may have been one of the factors that drove him to alcoholism. The common "mad heroine" theme that appears in many of his plays may have been influenced by his sister. Characters in his plays are often seen to be direct representations of his family members. Laura Wingfield in The Glass Menagerie is understood to be modeled on Rose. 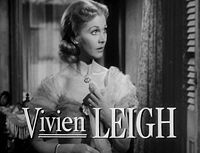 Some biographers say that the character of Blanche DuBois in A Streetcar Named Desire is based on her as well and a small part on Williams himself. At the time Williams wrote A Streetcar Named Desire he believed he was going to die and that this play would be his swan song. The motif of lobotomy also arises in Suddenly, Last Summer. Amanda Wingfield in The Glass Menagerie can easily be seen to represent Williams' mother. Many of his characters are considered autobiographical, including Tom Wingfield in The Glass Menagerie and Sebastian in Suddenly, Last Summer. Actress Anne Meacham was a close personal friend of Tennessee Williams and played the lead in many of his plays including Suddenly, Last Summer. In his memoirs, he claims he became sexually active as a teenager. His biographer, Lyle Leverich, maintained this actually occurred later, in his late 20s. Williams' play, The Parade, or Approaching the End of a Summer, written when he was 29 and worked on throughout his life, is an autobiographical depiction of an early romance in Provincetown, Massachusetts. This play was only recently produced for the first time on October 1, 2006 in Provincetown by the Shakespeare on the Cape production company, as part of the First Annual Provincetown Tennessee Williams Festival. The Parade, or Approaching the End of a Summer will be published by New Directions in the spring of 2008, in a collection of previously unpublished plays titled The Traveling Companion and Other Plays, edited by Williams scholar Annette J. Saddik. Williams's relationship with Frank Merlo, a second generation Sicilian American who had served in the U.S. Navy in World War II, lasted from 1947 until Merlo's death from cancer in 1963, and provided stability when Williams produced his most enduring works. Merlo provided balance to many of Williams' frequent bouts with depression, especially the fear that like his sister, Rose, he would go insane. During the late 1950s and 1960s, Williams faced harsh criticism from a number of theater critics. Due to McCarthyism, the country was steeped in conservatism and many attacked Williams because of his homosexuality. As Williams matured, his writing became more experimental in works such as "Out Cry," further alienating him from the critics. The death of his partner drove Williams into a deep, decade-long episode of depression. 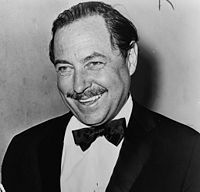 Tennessee Williams died at the age of 71 after he choked on a pill-bottle cap in his room at the Hotel Elysee in New York. Some, including his brother Dakin, believe he was murdered. In contrast, the police report from his death seems to indicate that drugs were involved; many prescription drugs were found in the room, and the lack of an adequate gag response that would have released the bottle cap from his throat may have been due to drug and alcohol influence. Williams' funeral took place on Saturday March 3, 1983 at St. Malachy's Roman Catholic Church in NYC. Williams' body was interred in the Calvary Cemetery, St. Louis, Missouri, despite his stated desire to be buried at sea at approximately the same place as the poet Hart Crane, whom he considered one of his most significant influences. He left his literary rights to Sewanee, The University of the South in honor of his grandfather, Walter Dakin, an alumnus of the university located in Sewanee, Tennessee. The funds today support a creative writing program. When his sister Rose died after many years in a mental institution, she bequeathed over 50 million dollars from her part of the Williams estate to Sewanee, The University of the South as well. The various experiences of Williams' eventful life often find manifestations within his work. For example, Cat On A Hot Tin Roof contains references to, among others, homosexuality, mental instability and alcoholism. Gore Vidal refers to Williams as the "Glorious Bird" when he met him in Rome after World War II. He noted the image of "the bird is everywhere in his work"
In 1989, Williams was inducted into the St. Louis Walk of Fame. Gussow, Mel and Kenneth Holditch (eds.). Tennessee Williams, Plays 1937-1955 (Library of America, 2000) ISBN 9781883011864. Gussow, Mel and Kenneth Holditch (eds.). Tennessee Williams, Plays 1957-1980 (Library of America, 2000) ISBN 9781883011871. ↑ Your Guide to Understanding Southern Gothic. Oprah.com. Retrieved November 26, 2007. ↑ The Historic New Orleans Collection, The Historic New Orleans Collection. Retrieved March 17, 2008. ↑ N.D. Jeste, B.W. Palmer, and D.V. Jeste, 2004, Tennessee Williams, Am J Geriatr Psychiatry. 12:4:370-5. PMID: 15249274. Retrieved November 26, 2007. ↑ Vidal, Gore. 1995. Palimpsest. New York, NY: Random House. ISBN 0679440380. Gross, Robert F., (ed.). 2002. Tennessee Williams: A Casebook. New York, NY: Routledge. ISBN 0815331746. Leverich, Lyle. 1997. Tom: The Unknown Tennessee Williams. New York, NY: Crown Publishers. ISBN 0517702258. Saddik, Annette. 1999. The Politics of Reputation: The Critical Reception of Tennessee Williams' Later Plays. London, UK: Associated University Presses. ISBN 9780838637722. Spoto, Donald. 1997. The Kindness of Strangers: The Life of Tennessee Williams. New York, NY: Da Capo Press. ISBN 0306808056. Williams, Tennessee. 1975. Memoirs. New York, NY: Doubleday. ISBN 0385005733. Williams, Dakin. 1983. His Brother's Keeper: The Life and Murder of Tennessee Williams. Collinsville, IL: Dakin's Corner Press. ISBN 9780877954880. A photograph of Tennessee Williams – by Yousuf Karsh on the website of the National Gallery of Australia. American Experience on PBS – Tennessee Williams is featured in this documentary about New Orleans first aired February 12, 2007. This page was last modified on 5 August 2013, at 19:19.